Got a new front tire for my bicycle at Bauer's, Aunt Laura gave it to me. GEorge Polk & I went to Locust grove 7 p.m. to report about dinning table we saw at Guilford & played billiards. I played better. 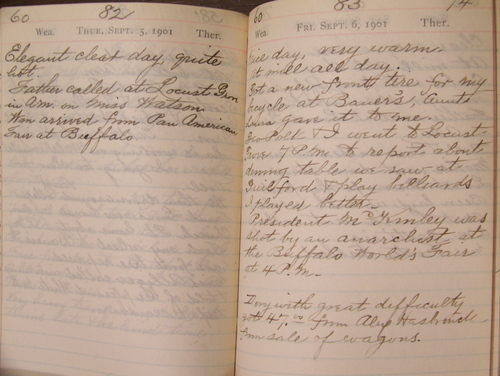 President McKinley was shot by an anarchists at the Buffalo World's Fair at 4 p.m.
Dory with great difficulty got $47.00 from Alex Hasbrouck from sale of wagons. Elegant day, one of the year's best. 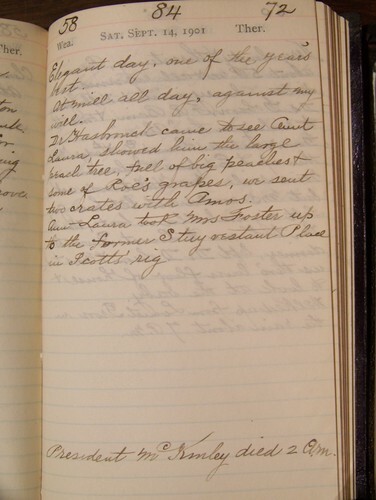 Dr. Hasbrouck came to see Aunt Laura, showed him the large peach tree full of big peaches & some of Roe's grapes, we sent two crates with Amos. Aunt Laura took Mrs. Foster up to the former Stuyvestant Place in Scott's rig. President McKinley died 2 a.m.